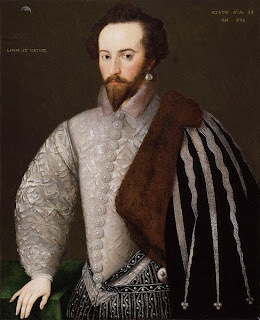 Savages who drink the powdered bones of their dead mixed with wine, Amazons who hold riotous festivals, the worship of golden statues, all the primitive wonders of Guiana are described by the famous Elizabethan gallant, Sir Walter Raleigh. Although, as I am persuaded, Guiana cannot be entered that way, yet no doubt the trade of gold from thence passeth by branches of rivers into the river of Amazons, and so it doth on every hand far from the country itself; for those Indians of Trinidad have plates of gold from Guiana, and those cannibals of Dominica which dwell in the islands by which our ships pass yearly to the West Indies, also the Indians of Paria, those Indians called Tucaris, Chochi, Apotomios, Cumanagotos, and all those other nations inhabiting near about the mountains that run from Paria thorough the province of Venezuela, and in Maracapana,and the cannibals of Guanipa, the Indians called Assawai, Coaca, Ajai, and the rest (all which shall be described in my description as they are situate) have plates of gold of Guiana. And upon the river of Amazons, Thevet writeth that the people wear croissants of gold, for of that form the Guianians most commonly make them; so as from Dominica to Amazons, which is above 250 leagues, all the chief Indians in all parts wear of those plates of Guiana. Undoubtedly those that trade [with] Amazons return much gold, which (as is aforesaid) cometh by trade from Guiana, by some branch of a river that falleth from the country into Amazons, and either it is by the river which passeth by the nations called Tisnados, or by Caripuna. I made enquiry amongst the most ancient and best travelled of the Orenoqueponi, and I had knowledge of all the rivers between Orenoque and Amazons, and was very desirous to understand the truth of those warlike women, because of some it is believed, of others not. And though I digress from my purpose, yet I will set down that which hath been delivered me for truth of those women, and I spake with a cacique, or lord of people, that told me he had been in the river, and beyond it also. The nations of these women are on the south side of the river in the provinces of Topago, and their chiefest strengths and retracts are in the islands situate on the south side of the entrance, some 60 leagues within the mouth of the said river. The memories of the like women are very ancient as well in Africa as in Asia. In Africa those that had Medusa for queen; others in Scythia, near the rivers of Tanais and Thermodon. We find, also, that Lampedo and Marthesia were queens of the Amazons. In many histories they are verified to have been, and in divers ages and provinces; but they which are not far from Guiana do accompany with men but once in a year, and for the time of one month, which I gather by their relation, to be in April; and that time all kings of the borders assemble, and queens of the Amazons; and after the queens have chosen, the rest cast lots for their valentines. This one month they feast, dance, and drink of their wines in abundance; and the moon being done they all depart to their own provinces. . . . . They are said to be very cruel and bloodthirsty, especially to such as offer to invade their territories. These Amazons have likewise great store of these plates of gold, which they recover by exchange chiefly for a kind of green stones, which the Spaniards call piedras hijadas, and we use for spleen-stones; 1 and for the disease of the stone we also esteem them. Of these I saw divers in Guiana; and commonly every king or cacique hath one, which their wives for the most part wear, and they esteem them as great jewels. But to return to the enterprise of Berreo, who, as I have said, departed from Nuevo Reynowith 700 horse, besides the provisions above rehearsed. He descended by the river calledCassanar, which riseth in Nuevo Reyno out of the mountains by the city of Tunja, from which mountain also springeth Pato; both which fall into the great river of Meta, and Metariseth from a mountain joining to Pamplona, in the same Nuevo Reyno de Granada.These, as also Guaiare, which issueth out of the mountains by Timana, fall all intoBaraquan, and are but of his heads; for at their coming together they lose their names, andBaraquan farther down is also rebaptized by the name of Orenoque. On the other side of the city and hills of Timana riseth Rio Grande, which falleth into the sea by Santa Marta.By Cassanar first, and so into Meta, Berreo passed, keeping his horsemen on the banks, where the country served them for to march; and where otherwise, he was driven to embark them in boats which he builded for the purpose, and so came with the current down the river of Meta, and so into Baraquan. After he entered that great and mighty river, he began daily to lose of his companies both men and horse; for it is in many places violently swift, and hath forcible eddies, many sands, and divers islands sharp pointed with rocks. But after one whole year, journeying for the most part by river, and the rest by land, he grew daily to fewer numbers; from both by sickness, and by encountering with the people of those regions thorough which he travelled, his companies were much wasted, especially by divers encounters with the Amapaians. 2 And in all this time he never could learn of any passage into Guiana, nor any news or fame thereof, until he came to a further border of the said Amapaia, eight days’ journey from the river Caroli, 3 which was the furthest river that he entered. Among those of Amapaia, Guiana was famous; but few of these people accosted Berreo, or would trade with him the first three months of the six which he sojourned there. This Amapaia is also marvellous rich in gold, as both Berreoconfessed and those of Guiana with whom I had most conference; and is situate uponOrenoque also. In this country Berreo lost sixty of his best soldiers, and most of all his horse that remained in his former year’s travel. But in the end, after divers encounters with those nations, they grew to peace, and they presented Berreo with ten images of fine gold among divers other plates and croissants, which, as he sware to me, and divers other gentlemen, were so curiously wrought, as he had not seen the like either in Italy, Spain, or the Low Countries; and he was resolved that when they came to the hands of the Spanish king, to whom he had sent them by his camp-master, they would appear very admirable, especially being wrought by such a nation as had no iron instruments at all, nor any of those helps which our goldsmiths have to work withal. The particular name of the people in Amapaia which gave him these pieces, are called Anebas, and the river of Orenoque at that place is about twelve English miles broad, which may be from his outfall into the sea 700 or 800 miles. This province of Amapaia is a very low and a marish ground near the river; and by reason of the red water which issueth out in small branches thorough the fenny and boggy ground, there breed divers poisonful worms and serpents. And the Spaniards not suspecting, nor in any sort foreknowing the danger, were infected with a grievous kind of flux by drinking thereof, and even the very horses poisoned therewith; insomuch as at the end of the six months that they abode there, of all their troops there were not left above 120 soldiers, and neither horse nor cattle. For Berreo hoped to have found Guiana be 1,000 miles nearer than it fell out to be in the end; by means whereof they sustained much want, and much hunger, oppressed with grievous diseases, and all the miseries that could be imagined, I demanded of those in Guiana that had travelled Amapaia, how they lived with that tawny or red water when they travelled thither; and they told me that after the sun was near the middle of the sky, they used to fill their pots and pitchers with that water, but either before that time or towards the setting of the sun it was dangerous to drink of, and in the night strong poison. I learned also of divers other rivers of that nature among them, which were also, while the sun was in the meridian, very safe to drink, and in the morning, evening, and night, wonderful dangerous and infective. From this province Berreo hasted away as soon as the spring and beginning of summer appeared, and sought his entrance on the borders of Orenoque on the south side; but there ran a ledge of so high and impassable mountains, as he was not able by any means to march over them, continuing from the east sea into which Orenoque falleth, even to Quito in Peru. Neither had he means to carry victual or munition over those craggy, high, and fast hills, being all woody, and those so thick and spiny, and so full or prickles, thorns, and briars, as it is impossible to creep thorough them. He had also neither friendship among the people, nor any interpreter to persuade or treat with them; and more, to his disadvantage, the caciques and kings ofAmapaia had given knowledge of his purpose to the Guianians, and that he sought to sack and conquer the empire, for the hope of their so great abundance and quantities of gold. He passed by the mouths of many great rivers which fell into Orenoque both from the north and south, which I forbear to name, for tediousness, and because they are more pleasing in describing than reading. Berreo affirmed that there fell an hundred rivers into Orenoque from the north and south: whereof the least was as big as Rio Grande, 4 that passed between Popayan and Nuevo Reyno de Granada, Rio Grande being esteemed one of the renowned rivers in all the West Indies, and numbered among the great rivers of the world. But he knew not the names of any of these, but Caroli only; neither from what nations they descended, neither to what provinces they led, for he had no means to discourse with the inhabitants at any time; neither was he curious in these things, being utterly unlearned, and not knowing the east from the west. But of all these I got some knowledge, and of many more, partly by mine own travel, and the rest by conference; of some one I learned one, of others the rest, having with me an Indian that spake many languages, and that of Guiana 5 naturally. I sought out all the aged men, and such as were greatest travellers. And by the one and the other I came to understand the situations, the rivers, the kingdoms from the east sea to the borders of Peru, and from Orenoque southward as far as Amazons or Marañon, and the regions of Marinatambal, 6 and of all the kings of provinces, and captains of towns and villages, how they stood in terms of peace or war, and which were friends or enemies the one with the other; without which there can be neither entrance nor conquest in those parts, nor elsewhere. For by the dissension between Guascar and Atabalipa, Pizarro conquered Peru, and by the hatred that the Tlaxcallians bare to Mutezuma, Cortes was victorious over Mexico; without which both the one and the other had failed of their enterprise, and of the great honour and riches which they attained unto. Now Berreo began to grow into despair, and looked for no other success than his predecessor in this enterprise; until such time as he arrived at the province of Emeria towards the east sea and mouth of the river, where he found a nation of people very favourable, and the country full of all manner of victual. The king of this land is called Carapana, a man very wise, subtle, and of great experience, being little less than an hundred years old. In his youth he was sent by his father into the island of Trinidad, by reason of civil war among themselves, and was bred at a village in that island, called Parico. At that place in his youth he had seen many Christians, both French and Spanish, and went divers times with the Indians of Trinidad to Margarita and Cumaná, in the West Indies, for both those places have ever been relieved with victual from Trinidad: by reason whereof he grew of more understanding, and noted the difference of the nations, comparing the strength and arms of his country with those of the Christians, and ever after temporised so as whosoever else did amiss, or was wasted by contention, Carapana kept himself and his country in quiet and plenty. He also held peace with the Caribs or cannibals, his neighbours, and had free trade with all nations, whosoever else had war. Berreo sojourned and rested his weak troop in the town of Carapana six weeks, and from him learned the way and passage to Guiana, and the riches and magnificence thereof. But being then utterly unable to proceed, he determined to try his fortune another year, when he had renewed his provisions, and regathered more force, which he hoped for as well out of Spain as from Nuevo Reyno, where he had left his son Don Antonio Ximenes to second him upon the first notice given of his entrance; and so for the present embarked himself in canoas, and by the branches of Orenoque arrived at Trinidad, having from Carapana sufficient pilots to conduct him. From Trinidad he coasted Paria, and so recovered Margarita; and having made relation to Don Juan Sarmiento, the Governor, of his proceeding, and persuaded him of the riches of Guiana, he obtained from thence fifty soldiers, promising presently to return to Carapana, and so into Guiana. But Berreo meant nothing less at that time; for he wanted many provisions necessary for such an enterprise, and therefore departed from Margarita, seated himself in Trinidad, and from thence sent his camp-master and his sergeant-major back to the borders to discover the nearest passage into the empire, as also to treat with the borderers, and to draw them to his party and love; without which, he knew he could neither pass safely, nor in any sort be relieved with victual or aught else. Carapana directed his company to a king called Morequito, assuring them that no man could deliver so much Guiana as Morequito could, and that his dwelling was but five days’ journey from Macureguarai, the first civil town of Guiana. Now your lordship shall understand that this Morequito, one of the greatest lords or kings of the borders of Guiana, had two or three years before been at Cumaná and at Margarita,in the West Indies, with great store of plates of gold, which he carried to exchange for such other things as he wanted in his own country, and was daily feasted, and presented by the governors of those places, and held amongst them some two months. In which time one Vides, Governor of Cumaná, won him to be his conductor into Guiana, being allured by those croissants and images of gold which he brought with him to trade, as also by the ancient fame and magnificence of El Dorado; whereupon Vides sent into Spain for a patent to discover and conquer Guiana, not knowing of the precedence of Berreo’s patent; which, as Berreo affirmeth, was signed before that of Vidas. So as when Vides understood of Berreo and that he had made entrance into that territory, and foregone his desire and hope, it was verily thought that Vides practised with Morequito to hinder and disturb Berreo in all he could, and not to suffer him to enter through his seignory, nor any of his companies; neither to victual, nor guide them in any sort. For Vides, Governor of Cumaná,and Berreo, were become mortal enemies, as well for that Berreo had gotten Trinidad into his patent with Guiana, as also in that he was by Berreo prevented in the journey of Guiana itself. Howsoever it was, I know not, but Morequito for a time dissembled his disposition, suffered ten Spaniards and a friar, which Berreo has sent to discover Manoa,to travel through his country, gave them a guide for Macureguarai, the first town of civil and apparelled people, from whence they had other guides to bring them to Manoa, the great city of Inga; and being furnished with those things which they had learned ofCarapana were of most price in Guiana, went onward, and in eleven days arrived atManoa, as Berreo affirmeth for certain; although I could not be assured thereof by the lord which now governeth the province of Morequito, for he told me that they got all the gold they had in other towns on this side Manoa, there being many very great and rich, and (as he said) built like the towns of Christians, with many rooms. When these ten Spaniards were returned, and ready to put out of the border ofAromaia, 7 the people of Morequito set upon them, and slew them all but one that swam the river, and took from them to the value of 40,000 pesos of gold; and one of them only lived to bring the news to Berreo, that both his nine soldiers and holy father were benighted in the said province. I myself spake with the captains of Morequito that slew them, and was at the place where it was executed. Berreo, enraged herewithal, sent all the strength he could make into Aromaia, to be revenged of him, his people, and country. ButMorequito, suspecting the same, fled over Orenoque, and thorough the territories of theSaima and Wikiri recovered Cumaná, where he thought himself very safe, with Vides the governor. But Berreo sending for him in the king’s name, and his messengers finding him in the house of one Fajardo, on the sudden, yere he was suspected, so as he could not then be conveyed away, Vides durst not deny him, as well to avoid the suspicion of the practice, as also for that an holy father was slain by him and his people. Morequito offered Fajardo the weight of three quintals in gold, to let him escape; but the poor Guianian, betrayed on all sides, was delivered to the camp-master of Berreo, and was presently executed. After the death of this Morequito, the soldiers of Berreo spoiled his territory and took divers prisoners. Among others they took the uncle of Morequito, called Topiawari, who is now king of Aromaia, whose son I brought with me into England, and is a man of great understanding and policy; he is above an hundred years old, and yet is of a very able body. The Spaniards led him in a chain seventeen days, and made him their guide from place to place between his country and Emeria, the province of Carapana aforesaid, and he was at last redeemed for an hundred plates of gold, and divers stones called piedras hijadas, or spleen-stones. Now Berreo for executing of Morequito, and other cruelties, spoils, and slaughters done in Aromaia, hath lost the love of the Orenoqueponi, and of all the borderers, and dare not send any of his soldiers any further into the land than to Carapana,which he called the port of Guiana; but from thence by the help of Carapana he had trade further into the country, and always appointed ten Spaniards to reside in Carapana’s town, 8 by whose favour, and by being conducted by his people, those ten searched the country thereabouts, as well for mines as for other trades and commodities. They also have gotten a nephew of Morequito, whom they have christened and named Don Juan, of whom they have great hope, endeavouring by all means to establish him in the said province. Among many other trades, those Spaniards used canoas to pass to the rivers of Barema, Pawroma, and Dissequebe, 9 which are on the south side of the mouth of Orenoque, and there buy women and children from the cannibals, which are of that barbarous nature, as they will for three or four hatchets sell the sons and daughters of their own brethren and sisters, and for somewhat more even their own daughters. Hereof the Spaniards make great profit; for buying a maid of twelve or thirteen years for three or four hatchets, they sell them again at Margarita in the West Indies for fifty and an hundred pesos, which is so many crowns. The master of my ship, John Douglas, took one of the canoas which came laden from thence with people to be sold, and the most of them escaped; yet of those he brought, there was one as well favoured and as well shaped as ever I saw any in England; and afterwards I saw many of them, which but for their tawny colour may be compared to any in Europe. They also trade in those rivers for bread of cassavi, of which they buy an hundred pound weight for a knife, and sell it at Margarita for ten pesos. They also recover great store of cotton, Brazil wood, and those beds which they call hamacas or Brazil beds, wherein in hot countries all the Spaniards use to lie commonly, and in no other, neither did we ourselves while we were there. By means of which trades, for ransom of divers of the Guianians, and for exchange of hatchets and knives, Berreo recovered some store of gold plates, eagles of gold, and images of men and divers birds, and dispatched his camp-master for Spain, with all that he had gathered, therewith to levy soldiers, and by the show thereof to draw others to the love of the enterprise. And having sent divers images as well of men as beasts, birds, and fishes, so curiously wrought in gold, he doubted not but to persuade the king to yield to him some further help, especially for that this land hath never been sacked, the mines never wrought, and in the Indies their works were well spent, and the gold drawn out with great labour and charge. He also despatched messengers to his son inNuevo Reyno to levy all the forces he could, and to come down the river Orenoque toEmeria, the province of Carapana, to meet him; he had also sent to Santiago de Leon on the coast of the Caracas, to buy horses and mules. After I had thus learned of his proceedings past and purposed, I told him that I had resolved to see Guiana, and that it was the end of my journey, and the cause of my coming to Trinidad, as it was indeed, and for that purpose I sent Jacob Whiddon the year before to get intelligence: with whom Berreo himself had speech at that time, and remembered how inquisitive Jacob Whiddon was of his proceedings, and of the country of Guiana. Berreowas stricken into a great melancholy and sadness, and used all the arguments he could to dissuade me; and also assured the gentlemen of my company that it would be labour lost, and that they should suffer many miseries if they proceeded. And first he delivered that I could not enter any of the rivers with any bark or pinnace, or hardly with any ship’s boat, it was so low, sandy, and full of flats, and that his companies were daily grounded in their canoes, which drew but twelve inches water. He further said that none of the country would come to speak with us, but would all fly; and if we followed them to their dwellings, they would burn their own towns. And besides that, the way was long, the winter at hand, and that the rivers beginning once to swell, it was impossible to stem the current; and that we could not in those small boats by any means carry victuals for half the time, and that (which indeed most discouraged my company) the kings and lords of all the borders of Guiana had decreed that none of them should trade with any Christians for gold, because the same would be their own overthrow, and that for the love of gold the Christians meant to conquer and dispossess them of all together. Many and the most of these I found to be true; but yet I resolving to make trial of whatsoever happened, directed Captain George Gifford, my Vice-Admiral, to take the Lion’s Whelp, and Captain Caulfield his bark, [and] to turn to the eastward, against the mouth of a river called Capuri, whose entrance I had before sent Captain Whiddon andJohn Douglas the master to discover. Who found some nine foot water or better upon the flood, and five at low water: to whom I had given instructions that they should anchor at the edge of the shoal, and upon the best of the flood to thrust over, which shoal John Douglas buoyed and beckoned 10 for them before. But they laboured in vain; for neither could they turn it up altogether so far to the east, neither did the flood continue so long, but the water fell yere they could have passed the sands. As we after found by a second experience: so as now we must either give over our enterprise, or leaving our ships at adventure 400 mile behind us, must run up in our ship’s boats, one barge, and two wherries. But being doubtful how to carry victuals for so long a time in such baubles, or any strength of men, especially for that Berreo assured us that his son must be by that time come down with many soldiers, I sent away one King, master of the Lion’s Whelp, with his ship-boat, to try another branch of the river in the bottom of the Bay of Guanipa, which was called Amana, to prove if there were water to be found for either of the small ships to enter. But when he came to the mouht of Amana, he found it as the rest, but stayed not to discover it thoroughly, because he was assured by an Indian, his guide, that the cannibals of Guanipa would assail them with many canoas, and that they shot poisoned arrows; so as if he hasted not back, they should all be lost. In the meantime, fearing the worst, I caused all the carpenters we had to cut down agalego boat, which we meant to cast off, and to fit her with banks to row on, and in all things to prepare her the best they could, so as she might be brought to draw but five foot: for so much we had on the bar of Capuri at low water. And doubting of King’s return, I sent John Douglas again in my long barge, as well to relieve him, as also to make a perfect search in the bottom of the bay; for it hath been held for infallible, that whatsoever ship or boat shall fall therein can never disemboque again, by reason of the violent current which setteth into the said bay, as also for that the breeze and easterly wind bloweth directly into the same. Of which opinion I have heard John Hampton, 11 of Plymouth, one of the greatest experience of England, and divers other besides that have traded to Trinidad. I sent with John Douglas an old cacique of Trinidad for a pilot, who told us that we could not return again by the bay or gulf, but that he knew a by-branch which ran within the land to the eastward, and he thought by it we might fall into Capuri, and so return in four days. John Douglas searched those rivers, and found four goodly entrances, whereof the least was as big as the Thames at Woolwich, but in the bay thitherward it was shoal and but six foot water; so as we were now without hope of any ship or bark to pass over, and therefore resolved to go on with the boats, and the bottom of the galego, in which we thrust 60 men. In the Lion’s Whelp’s boat and wherry we carried twenty, Captain Caulfieldin his wherry carried ten more, and in my barge other ten, which made up a hundred; we had no other means but to carry victual for a month in the same, and also to lodge therein as we could, and to boil and dress our meat. Captain Gifford had with him Master Edward Porter, Captain Eynos, and eight more in his wherry, with all their victual, weapons, and provisions. Captain Caulfield had with him my cousin Butshead Gorges, and eight more. In the galley, of gentlemen and officers myself had Captain Thyn, my cousin John Greenvile, my nephew John Gilbert, Captain Whiddon, Captain Keymis, Edward Hancock, Captain Clarke, Lieutenant Hughes, Thomas Upton, Captain Facy, Jerome Ferrar, Anthony Wells, William Connock, and above fifty more. We could not learn of Berreo any other way to enter but in branches so far to windward as it was impossible for us to recover; for we had as much sea to cross over in our wherries, as between Dover and Calice, and in a great bollow, the wind and current being both very strong. So as we were driven to go in those small boats directly before the wind into the bottom of the Bay of Guanipa, and from thence to enter the mouth of some one of those rivers which John Douglas had last discovered; and had with us for pilot an Indian of Barema, a river to the south of Orenoque, between that and Amazons, whose canoas we had formerly taken as he was going from the said Barema, laden with cassavi bread to sell at Margarita. This Arwacan promised to bring me into the great river of Orenoque; but indeed of that which he entered he was utterly ignorant, for he had not seen it in twelve years before, at which time he was very young, and of no judgment. And if God had not sent us another help, we might have wandered a whole year in that labyrinth of rivers, yere we had found any way, either out or in, especially after we were past ebbing and flowing, which was in four days. For I know all the earth doth not yield the like confluence of streams and branches, the one crossing the other so many times, and all so fair and large, and so like one to another, as no man can tell which to take: and if we went by the sun or compass, hoping thereby to go directly one way or other, yet that way we were also carried in a circle amongst multitudes of islands, and every island so bordered with high trees as no man could see any further than the breadth of the river, or length of the breach. But this it chanced, that entering into a river (which because it had no name, we called the River of the Red Cross, ourselves being the first Christians that ever came therein), the 22. of May, as we were rowing up the same, we espied a small canoa with three Indians, which by the swiftness of my barge, rowing with eight oars, I overtook yere they could cross the river. The rest of the people on the banks, shadowed under the thick wood, gazed on with a doubtful conceit what might befall those three which we had taken. But when they perceived that we offered them no violence, neither entered their canoa with any of ours, nor took out of the canoa any of theirs, they then began to show themselves on the bank’s side, and offered to traffic with us for such things as they had. And as we drew near, they all stayed; and we came with our barge to the mouth of a little creek which came from their town into the great river. As we abode here awhile, our Indian pilot, called Ferdinando, would needs go ashore to their village to fetch some fruits and to drink of their artificial wines, and also to see the place and know the lord of it against another time, and took with him a brother of his which he had with him in the journey. When they came to the village of these people the lord of the island offered to lay hands on them, purposing to have slain them both; yielding for reason that this Indian of ours had brought a strange nation into their territory to spoil and destroy them. But the pilot being quick and of a disposed body, slipt their fingers and ran into the woods, and his brother, being the better footman of the two, recovered the creek’s mouth, where we stayed in our barge, crying out that his brother was slain. With that we set hands on one of them that was next us, a very old man, and brought him into the barge, assuring him that if we had not our pilot again we would presently cut off his head. This old man, being resolved that he should pay the loss of the other, cried out to those in the woods to save Ferdinando, our pilot; but they followed him notwithstanding, and hunted after him upon the foot with their deer-dogs, and with so main a cry that all the woods echoed with the shout they made. But at the last this poor chased Indian recovered the river side and got upon a tree, and, as we were coasting, leaped down and swam to the barge half dead with fear. But our good hap was that we kept the other old Indian, which we handfasted to redeem our pilot withal; for, being natural of those rivers, we assured ourselves that he knew the way better than any stranger could. And, indeed, but for this chance, I think we had never found the way either to Guiana or back to our ships; for Ferdinando after a few days knew nothing at all, nor which way to turn; yea, and many times the old man himself was in great doubt which river to take. Those people which dwell in these broken islands and drowned lands are generally called Tivitivas. There are of them two sorts; the one called Ciawani, and the other Waraweete. The great river of Orenoque or Baraquan hath nine branches which fall out on the north side of his own main mouth. On the south side it hath seven other fallings into the sea, so it disemboqueth by sixteen arms in all, between islands and broken ground; but the islands are very great, many of them as big as the Isle of Wight, and bigger, and many less. From the first branch on the north to the last of the south it is at least 100 leagues, so as the river’s mouth is 300 miles wide at his entrance into the sea, which I take to be far bigger than that of Amazons. All those that inhabit in the mouth of this river upon the several north branches are these Tivitivas, of which there are two chief lords which have continual wars one with the other. The islands which lie on the right hand are called Pallamos, and the land on the left, Hororotomaka; and the river by which John Douglas returned within the land from Amana to Capuri they call Macuri. These Tivitivas are a very goodly people and very valiant, and have the most manly speech and most deliberate that ever I heard of what nation soever. In the summer they have houses on the ground, as in other places; in the winter they dwell upon the trees, where they build very artificial towns and villages, as it is written in the Spanish story of the West Indies that those people do in the low lands near the gulf of Uraba. For between May and September the river of Orenoque riseth thirty foot upright, and then are those islands overflown twenty foot high above the level of the ground, saving some few raised grounds in the middle of them; and for this cause they are enforced to live in this manner. They never eat of anything that is set or sown; and as at home they use neither planting nor other manurance, so when they come abroad they refuse to feed of aught but of that which nature without labour bringeth forth. They use the tops of palmitos for bread, and kill deer, fish, and porks for the rest of their sustenance. They have also many sorts of fruits that grow in the woods, and great variety of birds and fowls; and if to speak of them were not tedious and vulgar, surely we saw in those passages of very rare colours and forms not elsewhere to be found, for as much as I have either seen or read. Of these people those that dwell upon the branches of Orenoque, called Capuri, and Macureo, are for the most part carpenters of canoas; for they make the most and fairest canoas; and sell them into Guiana for gold and into Trinidad for tabacco, in the excessive taking whereof they exceed all nations. And notwithstanding the moistness of the air in which they live, the hardness of their diet, and the great labours they suffer to hunt, fish, and fowl for their living, in all my life, either in the Indies or in Europe, did I never behold a more goodly or better-favoured people or a more manly. They were wont to make war upon all nations, and especially on the Cannibals, so as none durst without a good strength trade by those rivers; but of late they are at peace with their neighbours, all holding the Spaniards for a common enemy. When their commanders die they use great lamentation; and when they think the flesh of their bodies is putrified and fallen from their bones, then they take up the carcase again and hang it in the cacique’s house that died, and deck his skull with feathers of all colours, and hang all his gold plates about the bones of this arms, thighs, and legs. Those nations which are called Arwacas, which dwell on the south of Orenoque, of which place and nation our Indian pilot was, are dispersed in many other places, and do use to beat the bones of their lords into powder, and their wives and friends drink it all in their several sorts of drinks. After we departed from the port of these Ciawani we passed up the river with the flood and anchored the ebb, and in this sort we went onward. The third day that we entered the river, our galley came on ground; and stuck so fast as we thought that even there our discovery had ended, and that we must have left four-score and ten of our men to have inhabited, like rooks upon trees, with those nations. But the next morning, after we had cast out all her ballast, with tugging and hauling to and fro we got her afloat and went on. At four days’ end we fell into as goodly a river as ever I beheld, which was called the great Amana, which ran more directly without windings and turnings than the other. But soon after the flood of the sea left us; and, being enforced either by main strength to row against a violent current, or to return as wise as we went out, we had then no shift but to persuade the companies that it was but two or three days’ work, and therefore desired them to take pains, every gentleman and others taking their turns to row, and to spell one the other at the hour’s end. Every day we passed by goodly branches of rivers, some falling from the west, others from the east, into Amana; but those I leave to the description in the chart of discovery, where every one shall be named with his rising and descent. When three days more were overgone, our companies began to despair, the weather being extreme hot, the river bordered with very high trees that kept away the air, and the current against us every day stronger than other. But we evermore commanded our pilots to promise an end the next day, and used it so long as we were driven to assure them from four reaches of the river to three, and so to two, and so to the next reach. But so long we laboured that many days were spent, and we driven to draw ourselves to harder allowance, our bread even at the last, and no drink at all; and our men and ourselves so wearied and scorched, and doubtful withal whether we should ever perform it or no, the heat increasing as we drew towards the line; for we were now in five degrees. Note 1. Stones reduced to powder and taken internally to cure maladies of the spleen. Note 2. Amapaia was Berrio’s name for the Orinoco valley above the Caura river. Note 3. The Caroni river, the first great affluent of the Orinoco on the south, about 180 miles from the see. Note 6. North coasts of Brazil. Note 7. The district below the Caroni river. Note 8. The Spanish settlement of Santo Tomé de la Guyana, founded by Berrio in 1591 or 1592, but represented by Raleigh as an Indian pueblo. Note 10. Beaconed, i. e. placed a beacon or signal upon the buoy. Note 11. Captain of the Minion in the third voyage of Hawkins.